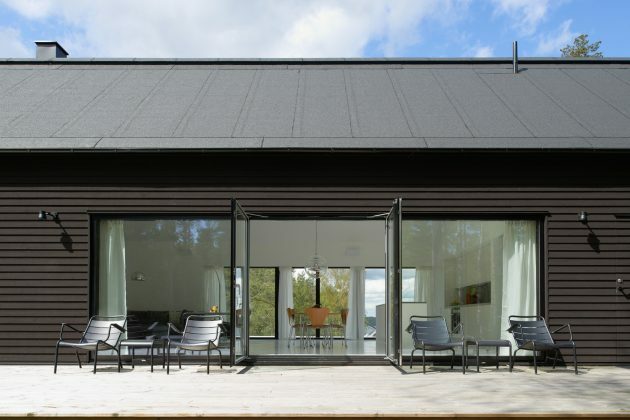 Erik Andersson Architects, a Stockholm-based studio, have designed Villa Wallin on the island of Yxlan in the northern archipelago of Stockholm, Sweden. 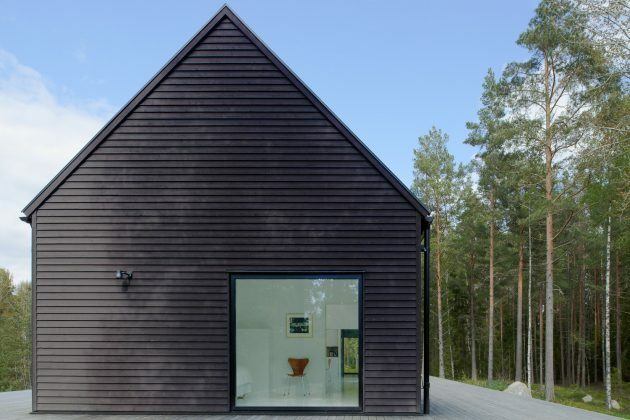 This island house is a strict manifestation of the Swedish villa archetype which is noticeable even from its 1:3 ratio. The rationalist proportional system is completed with the square windows of identical size. 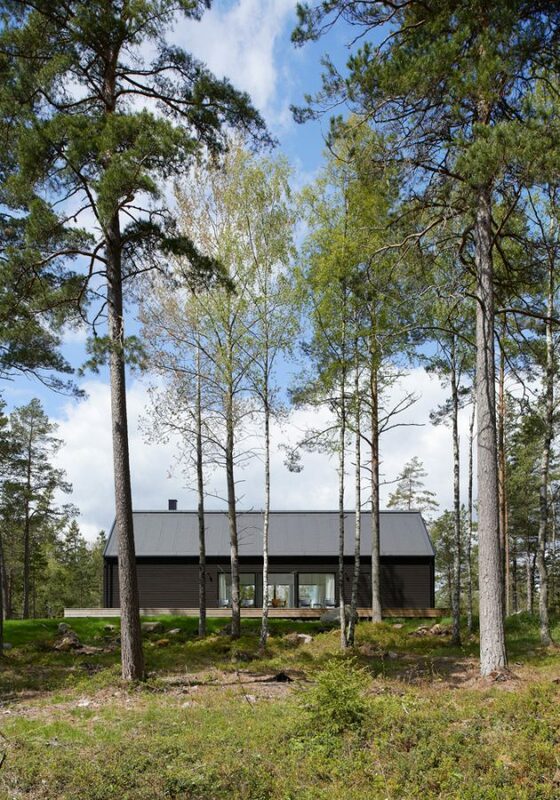 The villa is surrounded by pine trees and spruces that contrast the black, horizontal cladding of the home. It surroundings also make for beautiful views from the villa’s sunlit, wraparound terrace. 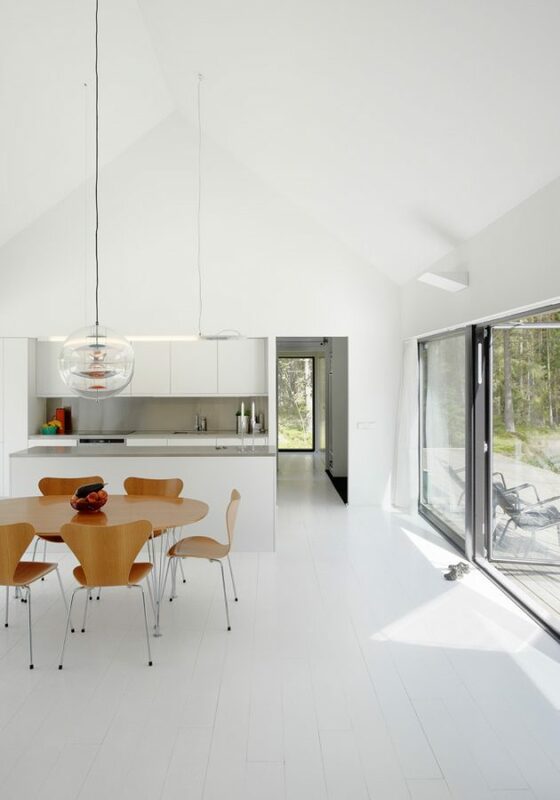 The whitewashed interior is designed in an open plan in order to make the most out of the limited space but that didn’t stop it from having a sauna. 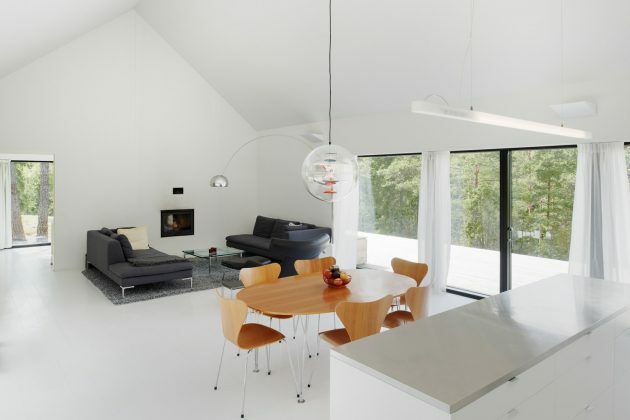 On Yxlan in the northern Stockholm archipelago, Erik Andersson Architects has designed the archetypal house. Designed strictly by using the proportional ratio of 1:3, the house measures six meters in depth, eighteen meters in length and six meters in height. The facade windows also follow a clear pattern: they are all square in form and have the same size. 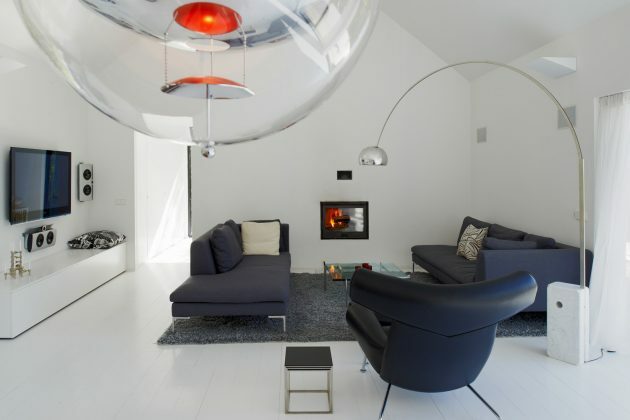 The villa is situated on natural ground, surrounded by pine trees and spruces, and much of the surroundings have been preserved. A terrace runs around the building, making it possible for the residents to lounge and enjoy the sun at any time of the day. 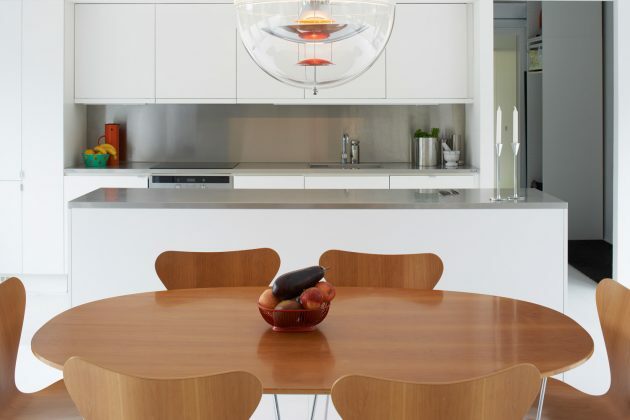 Glass panels on both sides open views right through the house and provide a constant contact with the sea. 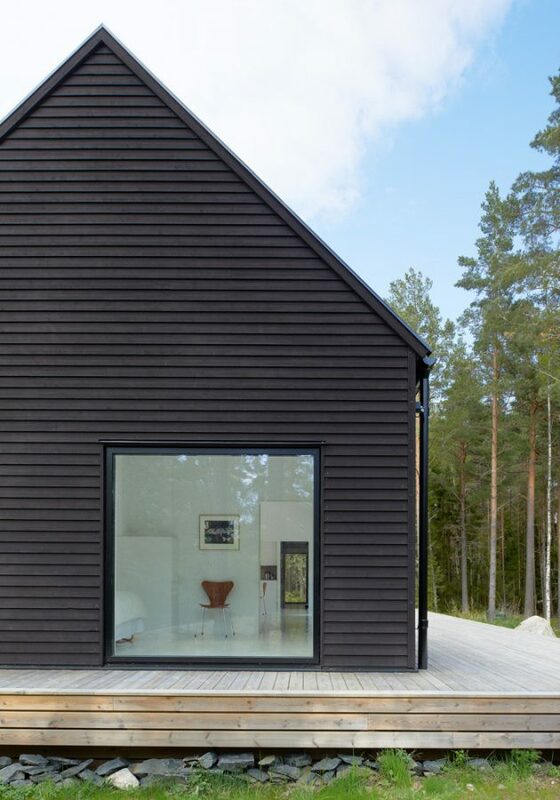 The house is clad with horizontal pine panels, painted black with Falu Rödfärg– a traditional Swedish paint that can be traced right back to the 16th century – while the roof is covered with tar felt. 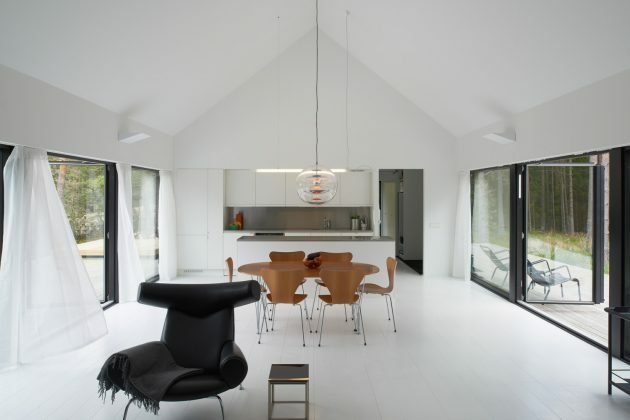 As a contrast to the black exterior, the interior is dominated by white. 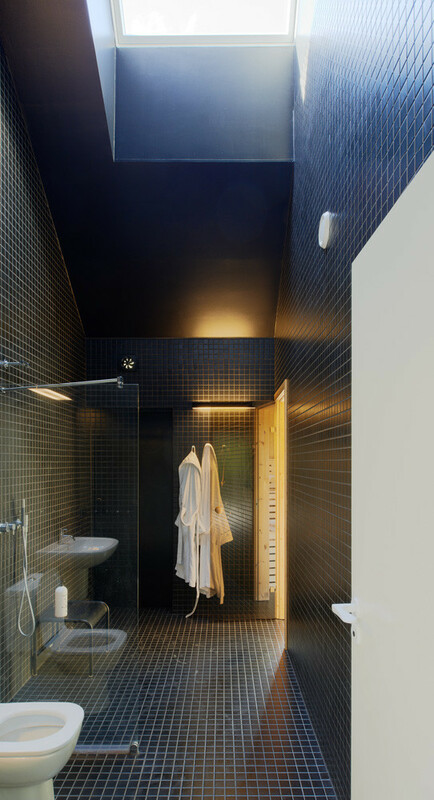 Everything from the walls and pine floors is painted white – except for the bathroom, where black tiles cover everything from the walls to the floor, and a window, high up in the ceiling, provides a glimpse of the sky. 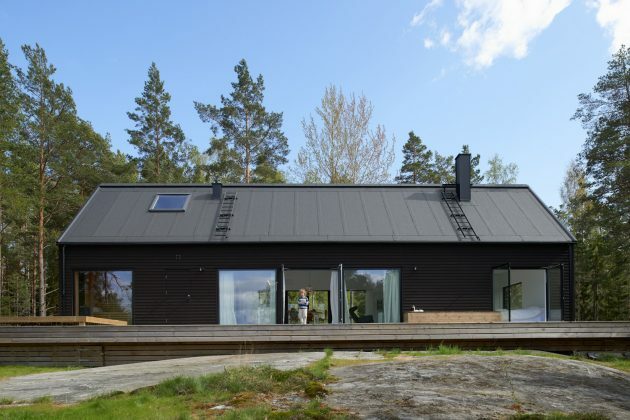 The house also features a sauna with a panoramic view to the sea and the cruise ships passing by, as well as a custom made outdoor plunge pool, which can be heated for winter use with a wood-fired stove.